HONG KONG (Reuters) - When Philippine President Benigno Aquino compared China to the Germany of 1938 and called for global support as his country battles Beijing's claims in the South China Sea, he put the focus on a case that Manila has filed in an international court. The Philippines has taken its dispute with China to arbitration under the United Nations' Convention on the Law of the Sea and its lawyers say that the tribunal has discretionary powers to allow other states to join the action. China is refusing to participate and has already warned Vietnam against joining the case being heard at the Permanent Court of Arbitration at The Hague, sources have said. Hanoi has so far kept its options open. Any final ruling by the court on the dispute, one of the most tense flashpoints in Asia, cannot be enforced but will carry considerable moral and political weight, analysts say. "If a large number of countries, including members of ASEAN, speak out in support of the application of international law to resolve disputes, Beijing might conclude that flouting the ruling of the tribunal is too costly, even if China's nine-dash line is found to be illegal," said Bonnie Glaser at the Centre for Strategic and International Studies in Washington. ASEAN, or the Association of Southeast Asian Nations, groups four of the claimants to the sea - Malaysia, the Philippines, Brunei and Vietnam - and six other countries in the region. China, and also Taiwan, claim much of the sea through a nine-dash line on Chinese maps that encompasses about 90 percent of its 3.5 million sq km (1.35 million sq mile) waters. The sea provides 10 percent of the global fisheries catch and carries $5 trillion in ship-borne trade each year. In an interview with the New York Times last week, Aquino compared China's claims to Germany in 1938. "At what point do you say, ‘Enough is enough'? Well, the world has to say it — remember that the Sudetenland was given in an attempt to appease Hitler to prevent World War 2," he said. Beijing has called the comparison outrageous. Admiral Samuel Locklear, head of the U.S. Pacific Command, and Daniel Russel, U.S. Assistant Secretary of State for East Asia and the Pacific, both voiced support last week for the Philippines' action in seeking a peaceful, lawful solution. The issue could also come up when Secretary of State John Kerry visits Beijing this week. China's state media has reported a patrol by two destroyers and a large amphibious landing ship at the James Shoal - about 80 km (50 miles) off the coast of the Malaysian state of Sarawak. 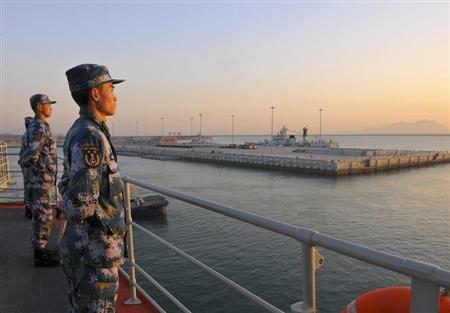 While Malaysia's navy chief denied the reports, China's official Xinhua news agency has since described how the ships have continued south, passing through Indonesia's strategic Lombok and Makassar straits to reach the Indian Ocean. Official Chinese reports last month also announced the basing of a 5,000-tonne civilian patrol ship in the Paracel Islands, which are claimed by Vietnam. Provincial authorities on the Chinese island of Hainan, meanwhile, have extended fishing restrictions into international waters - a step that sparked protests from Hanoi and Manila. Despite the lack of physical opposition to its moves, China appears to be wary about the proceedings in the court at The Hague. Chinese officials have warned Hanoi against joining the case, Vietnamese officials have privately said. Carl Thayer, a South China Sea expert at the Australian Defense Force Academy in Canberra, said he had been told by Vietnamese officials that one such warning was delivered by Foreign Minister Wang Yi during a visit to Hanoi last September. "Vietnam has so far stood up to the pressure and clearly reserved the right to take any step if it feels its national interests are at stake," Thayer said. Luong Thanh Nghi, a spokesman for Vietnam's Foreign Ministry, did not comment directly on Chinese pressure, including specific warnings from Wang, but told Reuters that Hanoi was closely monitoring Manila's legal moves. When asked whether Hanoi had decided on whether it would take part in the case, Nghi pointed to previous statements that Vietnam would apply "all necessary and appropriate peaceful means" to protect its sovereignty and national interests. Other Vietnamese officials said while it was unlikely Hanoi would join the case given its close but complex relationship with China, they were scrutinizing developments closely, including talking to foreign legal experts. In Beijing, Chinese Foreign Ministry spokeswoman Hua Chunying reiterated China's objections to the Philippines' action and said China and Vietnam had reached an "important consensus" over how to resolve the South China Sea dispute. "We are willing to maintain close touch with Vietnam and co-ordinate with them, to resolve the issue via friendly talks and consultation." Manila's five U.S. and British lawyers are finalizing submissions to be put to the court before a March 30 deadline to show that China's "nine-dash line" claim is invalid under the Law of the Sea. Philippines' lead counsel Paul Reichler, a Washington-based lawyer with the law firm Foley Hoag, said the arbitration tribunal had adopted rules that effectively allowed other states to apply to intervene. While no one had yet stepped forward "there is still plenty of time to do so," he told Reuters. A copy of the rules obtained from the court by Reuters last week does not mention third country interventions but gives the tribunal judges the power to decide on outside issues not covered by the document. Clive Schofield, a legal expert at the Australian National Centre for Ocean Resources and Security at the University of Wollongong, said the wording of the rules allowed for considerable leeway. "I do not believe that either one of the parties can block (third country) submissions should the tribunal members deem them to be helpful in determining the outcome of the case," he said.